Let me start by saying that Food Allergies in Children can be life threatening, and should be taken very seriously. 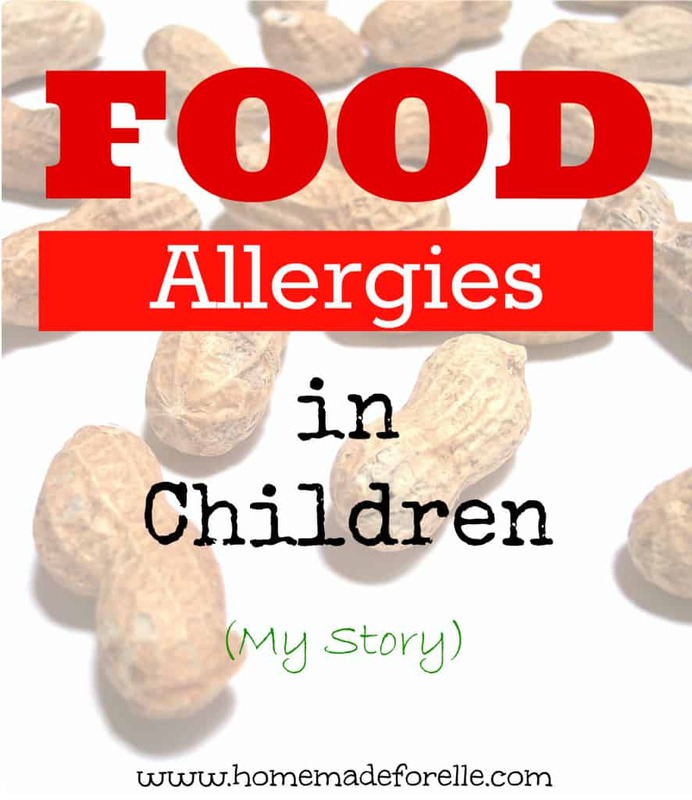 The information below is my story of discovering my daughter has food allergies. Nothing below should be used as or considered medical advice. If you suspect you or someone in your family has a food allergy, I strongly recommend you consult an allergist or other qualified medical professional to seek treatment. I’ll start by saying that I have food allergies. My first experience with food allergies occurred when I was around 7, and my ears started itching whenever I ate bananas (although, I didn’t realize at the time that it was an allergy). Later on, in my college years, I started having lip and throat swelling whenever I ate certain foods. Foods that I had eaten my whole life, were suddenly causing pretty severe reactions whenever I consumed them in small quantities. I spent years stressing about my food allergies, checking every label to see if it contained allergens, and basically living in fear every time I ate. Over time, I became more comfortable with the foods I ate, and I felt like I had a pretty good grasp on this food allergy business. Due to my background, I was extremely careful about introducing certain foods to my daughter, since I knew allergies can be genetic. I followed my pediatricians advice and introduced those foods after the age of 1, and did so cautiously. After a few encounters with foods I was allergic to, I figured we were pretty much out of the clear, and thought my daughter wouldn’t have to deal with the stress of them. Then, about 6 months ago, I decided on a whim to buy a certain food that is a common allergen, but one I am not allergic to. I offered my daughter (2 years old, at the time) one bite of this food, and she grabbed one tiny piece of it, and ate it. I offered her another bite, and she shook her head and walked away. Within a few minutes, I started to see raised red spots around her mouth, and my heart sank. I grabbed the bottle of Benadryl, and kept it close to see if her reaction was going to intensify, and within an hour, she was saying her stomach hurt. Shortly after, she started vomiting, so I administered Benadryl and gave her a bath. Once in the bath, her entire body broke out into violent hives, and I was ready to head to the ER. At the very welcomed insistence of some good friends, we took her to her pediatrician so he could prescribe her an epi-pen, and then we received a referral to a pediatric allergist. At the pediatric allergist, we had Elle tested for the common allergens, including environmental and food allergens. The skin test itself wasn’t as horrible as I had imagined it would be. 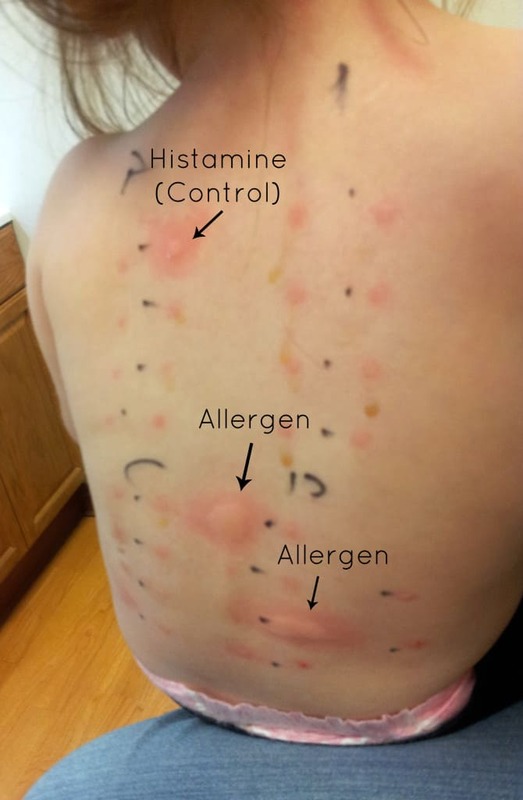 The pediatric allergist put some common allergens on multiple plastic pegs (for lack of a better word), and then gently pressed them onto my daughter’s back. She was understandably scared, but she wasn’t in excessive pain. We waited 10 minutes to see her reaction, and were alarmed to see how big and red two particular spots were. 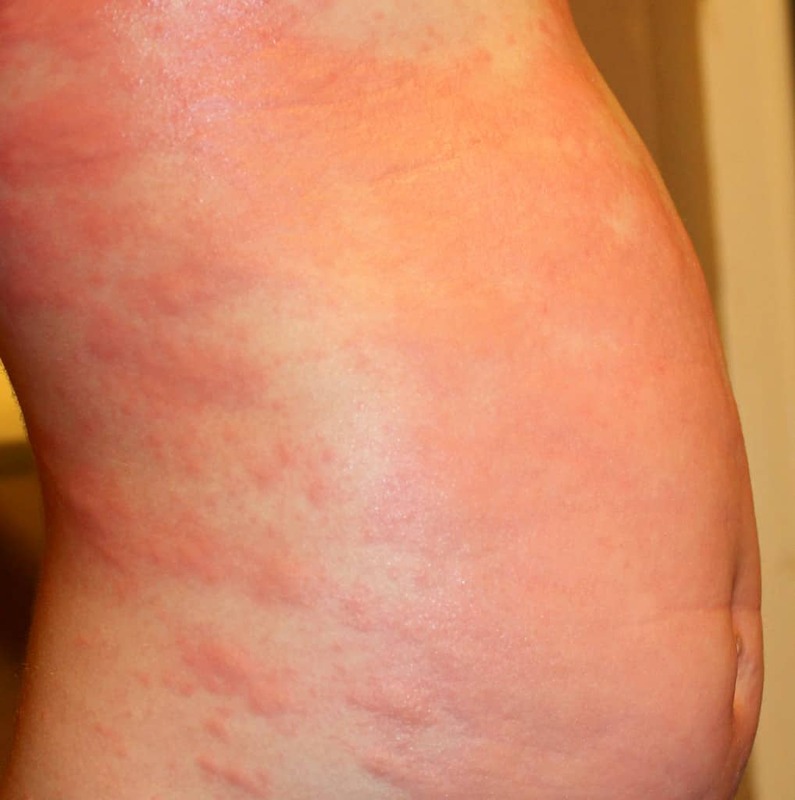 The allergic reactions are measured on a scale from 0 (no reaction) to ++4 (severe reaction). The histamine is a grade +4 (7mm), and as you can see, the allergic reactions she had (20mm) are much, much larger than the histamine . Both of her allergies were rated a ++4. After seeing the results of her allergy test, I knew that her allergies were much more severe than mine. 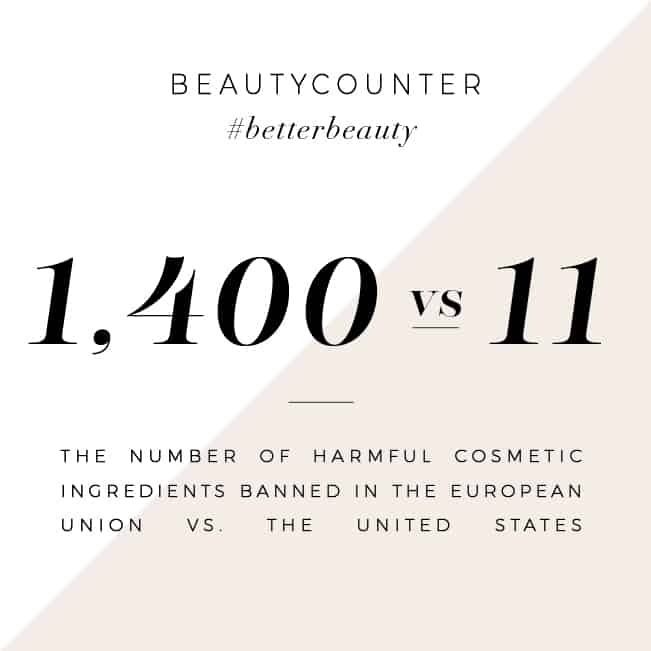 While I have been cautious about what I eat, I know that my daughter’s life could be at risk, if she is ever exposed to those foods again. 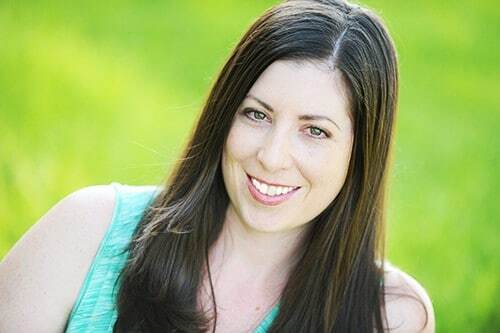 Since then, I have joined a couple support groups, read books, and scanned articles and forums to figure out the best way to manage my daughter’s food allergies. One of the hardest parts is convincing other people of the severity of her allergy. Because so many people have never been exposed to allergies, and are therefore not informed, some people probably think that I am a bit hysterical and excessively cautious. But each time I see a news article about a young child dying, or another child spending several days in the er after exposure to a food allergy, it makes me more resolved in my commitment to keep her safe. I am now an advocate for my child. I read every food label, every time. I contact companies to see if there are any possibilities of cross-contamination, before introducing a new product to my daughter. I look at allergen warnings at restaurants before we go out to eat, and if that information isn’t available, we don’t eat there. Most of her meals are prepared at home, using fresh, natural ingredients that have been checked for cross-contamination. I make sure her epi-pen is with her at all times, and that anyone who is ever around her understands the vigilance that must be taken to ensure her safety. I am by no means an expert, or qualified to dispense medical advice, but I have learned some things throughout this process. I have complied a list of tips, written by moms of children with food allergies, on how to help keep kids with food allergies safe. The biggest weapon against food allergies is knowledge, and I hope to be able to share some tips with others out there who find themselves in similar situations. I CANNOT express how much I can relate to this. we have 5 children and our 4th child(daughter..6 y.o.) is anaphylactic to dairy, egg..and allergic to many others. I know the fear…and I KNOW the looks you see on peoples faces when you are trying to explain the severity and dangers. I am grateful to have found this blog…we have known since she was 11 m.o….and she had an awful reaction to ice cream on easter. wow! That is so scary. I’m super thankful that we haven’t had any food allergies in our kids… yet. But since DH has them, we’re constantly on the look out, and try to limit common allergens in hopes that they never get an overload. Ooh, sorry to hear your husband has allergies 🙁 I think we all face our unique set of challenges in life, and this happens to be one of ours. I guess, if anything, I am happy I had some personal experience dealing with it, so it wasn’t so overwhelming when I found out my daughter had them. I sincerely hope your children will skip the gene, and not have to deal with food allergies!! I found out that my daughter had allergies when she was very young. She is 22 now we have had to watch what she eats and what she is around to this day. I am sorry to hear your daughter has them! How old was she when you found out? I am not certain how to educate my daughter about them, and am not certain about which age to start.